I found this maxi dress at a cute shop last week. It was too long and the sleeves were too tight, but the fabric was lovely enough to convince me to take it home. There were a few different options for this dress, but in the end i decided to shorten it and open up the sleeves a bit. I know that hemming a dress isn't a super big deal, but I did it verrrrryyyy carefully because I was terrified of messing up such a lovely piece! Here's a tip: after you have a baby, don't spend a bunch of money on new clothes because you're excited to wear pretty things again. You may just keep shrinking (which I'm not complaining about) and end up with a group of amazing dresses that look terrible on you. Do buy a few things and love yourself in them, but don't do what I did. Why am I saying all of this? Well, it's the long way around letting you know that I will be doing another "shop my closet" in the next week or two. This round will be some really great pieces, so I'll be sure to keep you updated in case you are interested in snagging anything. That dress is so cute now it's shortened! Can't wait to shop your closet! Love the dress and your glasses! Gorgeous! I have a big pile of alterations of my own to do. Wow... Amazing transformation! I've always wanted to shorten this black dress of mine but I don't have a talent with a needle and thread... Thanks for sharing! amazing! what a beautiful pattern. and might I add that your hair color is freakin stunning. You did such a great job! I am completely impressed. I want this dress so badly! i love that pattern!!! what a cutie pie you are! I had a baby 3 months ago and last month bought 2 new jeans. They are both baggy on me now. It's so hard to dress! Um I adore you. The new dress looks awesome! Now the dress is much better and it goes very well with your beautiful hair! The glasses make it for me! This is one of my favorite dresses on you, too! Once again, this seems a bit more casual, so it looks a bit more comfortable! Are you okay with us putting your photos on Pinterest? I love the dress pattern and it looks just adorable on you!! Such a lovely print! I love the alterations you made to it! I definitely need to learn how to sew. You did a lovely job. The dress is much cuter as a short summery thing. So adorable with those puffy sleeves and empire waist. Ooooh, I doubt if these great vintage pieces will be large enough to fit me after my second baby (don't be fooled, I haven't shrunk much and he's a little older than Poe - my waist is still 36" for crying out loud) but I'll keep an eye out cause I adore your sense of style. I'd love to know your tips on hemming a dress. YAY for continual shrinking! Way to go on that dress alteration. It's super cute. You did awesome! How cute are you?! You inspired me to go fix some clothes in my alter pile! What a terrific dress to get you ready for spring! Just looking at that dress makes me want to be in my gardens! Simply lovely! You did so great! I'm definitely going to keep an eye out for a shop your closet. Yay! This makes me kick myself for not knowing how to sew! You are so freakin inspiring. Too think of all the cute dresses I've passed up because they were too long! 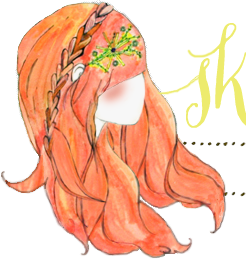 This is so cute Katie I really love the colours they look great with your hair! I bypass so much pretty stuff just because it doesnt fit right. Maybe I should start altering things! Your style and hair are just perfect! IF my hair wasn't so naturally pale blonde, I'd be want to be a redhead! I'd shop your closet anytime! Great job! I learned a long time ago to never pass up a great dress that didn't fit because I can always do alterations and make it happen! And I am excited about this 'shop my closet' thing. oh yes! Ah wow this is great! The good thing about shortening skirts is that you get so much left over fabric you could make a new skirt all together. Oh my goodness! That dress looks a million times more adorable after it was hemmed! Yoo cute! you look adorable in those glasses! I took a sewing class last year so that I could eventually learn to alter my vintage dresses, or even make my own... unfortunately I did not make it past the beginners classes, so I probably wouldn't be very handy with a job like this! Great job on the dress and I love those specs! Reeeallly pumped to see what items you put in your shop my closet! that looks wonderful! i see a lot of cute dresses that may be bigger & wayyy long for me, but i'll have to try re-fasioning pieces! Miss Katie i must know where your glasses are from! cute as a button as always! The newly shortened dress is amazing! The print just makes you automatically happy, and I am not even the one wearing it! I am very jealous of your hemming abilities! I too have MANY a lovely vintage dress that I would love to shorten a little bit! I did get a brandy new sewing machine for Christmas, so now all I need to do is learn how to use it :) If you have any tips or good tutorials, I would love to hear them! Wow! You turned a regular dress into something beautiful that perfectly suits you! I wish I had your skill! Now you have a pretty dress & a bunch of leftover fabric to make something sweet for your little girls! aww you look so adorable, the colors & so fun & perfect for spring! & I'd say hemming up anything is great, & esp doing a good job w/ it- like the wide hem you made, you look darling! that's awesome the weight just fell off you like that, did you work out or all natural? so cute! absolutely love it! This dress looks amazing shortened! Super cute and I love the glasses you accessorized it with! I was wondering if you have any recommendations for learning to how to alter clothing (such as bringing in the bust area, etc.)? I love reading your blog and seeing all the pretty things you post! Can't wait to see more! I love what you did with the dress and the color looks great with your hair! what a great find! It's so nice when you can alter something and make it all yours and know its unique! you're dress looks awesome! and so does your hair! can you post a tutorial on how to style it because I really want to learn. I bet you could re-purpose the extra fabric into something really cute for Posey! What a great vintage find and fix up! It is really cute...and so very YOU!!!! Well done. I wish I had this sort of talent. What great work resurrecting that dress! 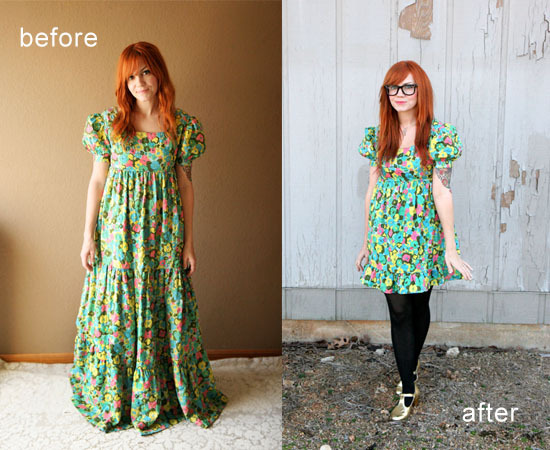 I love reading your blog and think this dress restyle is great. Would you consider doing a future blog post revealing just how you did it? I'd love to be able to rehem dresses etc but don't really know what I'm doing. I've just got a sewing machine for the first time so am eager to try things out! Wow, it's incredible what some scissors (and a clever girl) can do! The dress looks amazing, and I feel inspired to try some vintage dress re-stylin' now too! That dress is amazing! It is the perfect length for you! delurking to ask a personal question - i hope you dont mind...your so thin....how did you manage that so quickly after the birth of your daughter? ?